Eight images of Feniscowles Hall, the one time home of Sir William Feilden (1772 - 1850) - Baronet. 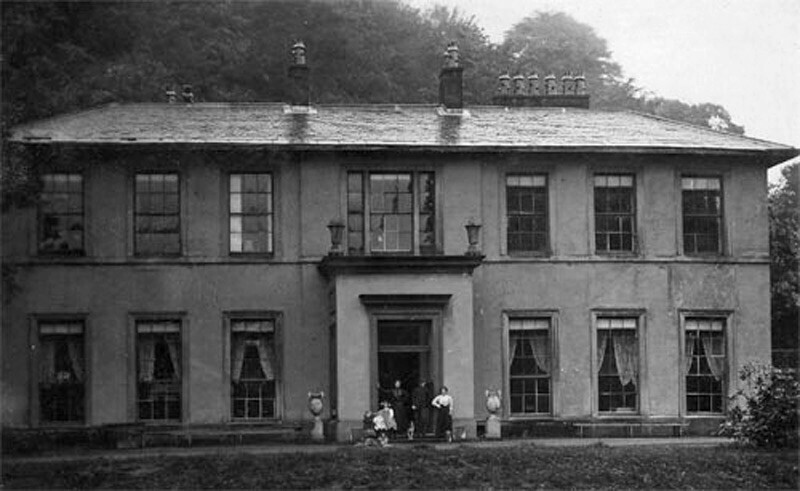 William was the brother of Henry Feilden, who built Witton House. The oldest image here is the lithograph (third down), which dates to around 1840. The hall was built in 1808, after William had purchased the estate from Thomas Ainsworth. When William Snr died in 1850, the hall was left in the hands of his son, William Henry Feilden. He re-located to Scarborough in about 1880 and the hall passed into other hands, but eventually started to fall into disrepair around 1911. 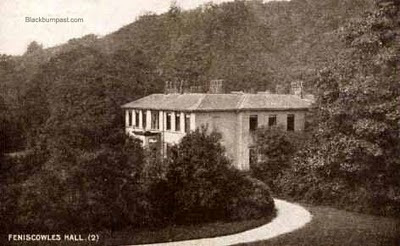 I first visited the hall in about 1970, when it was already a ruin and had been so for many decades, as far as I'm aware. The shell remains to this day, as you can see from the two coloured images taken by Ken Phillips in recent times (c2011), but from the old images, you can see how grand it once was. COURTESY OF THE CP COLLECTION (Except the top image and the bottom image of the gates, which is courtesy of Blackburn Library Services). COLOURED IMAGES OF THE RUIN, COURTESY OF KEN PHILLIPS. delighted to see these old photos. I visited the site in 1978 when the house was gone. The 1st baronet was father of my great grandmother, Frances Eliza who married Andrew Hamilton. Her son William came to New Zealand about 1897 and his son, William developed the jetboat. I have an old "book of friendship" of Mary Houghton Jackson dating to before 1850 and am reading My African Farm by Eliza Whigham Feilden, wife of Leyland Feilden. I'm glad you like the old photos June. 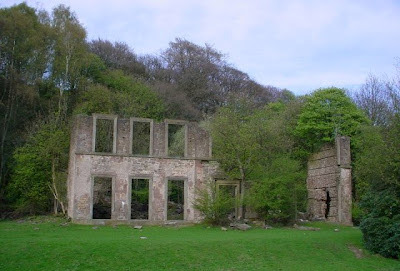 I think there's a 2 storey wall/elevation still standing on the site of Feniscowles Hall, as well as a few smaller walls and I believe there's still access to an old cellar or two. My uncle has higher pleasington farm. I went on a walk and discovered this place today. Because my uncle owns suaves of land i have explored a lot of iteither with my other unle or with my farming uncle. I have 2 uncles! 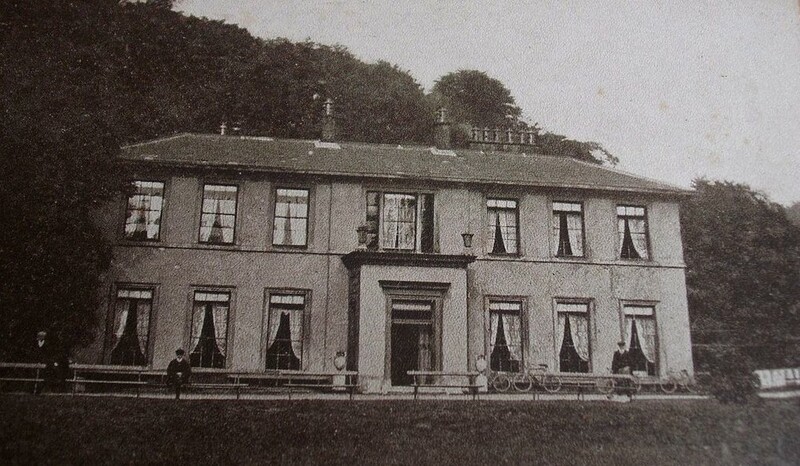 Further to speaking with my grandad i am able to find alot of information relating to what the purpose was of this house. Yes used for weddings etc. relations to who owned the property live in abbey village. i have also accessed more pics of what actually lies beneath in the cellar and there are dungeons. Also i have been told a book called road to nabs end relates to the history of Fensicowels Hall. Also during the night the place is hunted by Peppers Ghost which my grandad believes to have seen while staying in the hall as a child. I'm not sure why they might have needed dungeons ;-) Wine cellars, larders, cold rooms, other food stores and the like, I'm sure they will have had, but can't see why they would need to imprison anyone. I think there is still (limited) access to the cellars. I read a comment or two on another website about a year ago from someone who had recently been exploring the ruin. I've read 'The Road To Nab End' and for a little while had contact with the author. It's about a boy growing up in poverty in Blackburn's weaving community around the Griffin area. I can't even recall a mention of Feniscowles Hall in the book. Peppers Ghost sounds interesting. Do you know who he or she might have been? I'll dig out the photo I have showing the entrance gate and the ''Teas & Refreshments'' sign and add it sometime. If you would like me to add your cellar photos, I would be happy to, just send me an e-mail address and I'll reply to you. Your e-mail wont be published anywhere. All comments have to be moderated by myself before being published. I would be interested in seeing the photo with the "Teas and Refreshments" sign...it may be connected with my family tree. The bottom photo is the one I was talking about. The sign is on the right. It can't really be read clearly in the original (which is in a book about old Blackburn that I have), but I've looked at it through a magnifying glass and it appears to say Feniscowles Hall Pleasure Grounds - Teas & Refreshments Provided - Weddings and Picnic Parties - Accommodation and then there's bits I can't read at all. Towards the bottom left of the sign it says Open Daily. I don't think there's anyone's name on it. Thanks for your reply Colin, I didn't realise it was that one sorry. Thanks for your detective work on the wording aswell! If I come across any more photos Michelle, I'll add them to this post. If it's any use to you, I know the hall was put up for sale in 1903, but failed to sell. The owners took it off the market a while later (not sure how much later) and it was from that point on that it began to fall into disrepair. In 1911, it was described as dilapidated. That info comes from a book about the Feilden family. This place is quite fascinating!. I have a book on a family called Fielding who were Earls of Denbigh and whose descendants still own Newnham Paddox, still not sure if they are related but sure would like to find out. By the way, the Pepper may have been a pet dog or horse of the Lord Feilden's just a wild guess really but I'm sure we would all be fascinated to know. 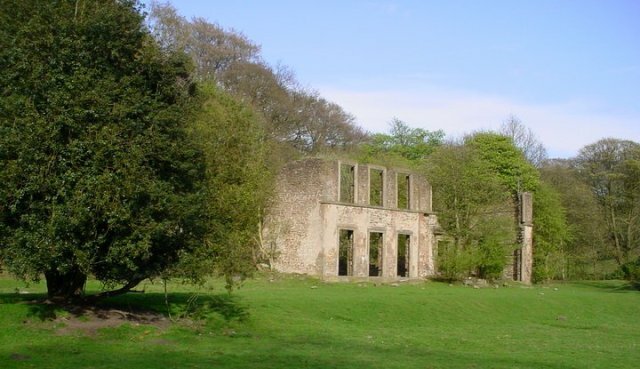 I'm only guessing, but if you have a look at the post for Woodfold Hall, by taking the roof off the building, they avoided paying some tax or rates on the property. So maybe the same thing happened with Feniscowles Hall too ? In it's latter years, I think it was owned by the local authority and I don't think they would have had any qualms about letting it become a ruin. I've read in the past that the river that ran by was polluted which caused the occupants to leave. Popped down last year, the cellar has pretty much collapsed on itself. Would have been fascinating to have seen inside this place before it was left to ruin. Is this the same story with the house that's hidden within Witton Park? Witton Hs (and the surrounding parkland) was bought by the local authority in about 1947 / 1948 or so from the Feilden family and there were various suggestions about what it should be used for. But a couple of years later, dry rot was discovered and they decided to demolish it, which they did in 1952. There's just the various outbuildings that remain. I have no idea who the current owner is, sorry. Who actually built Feniscowels Hall? I have the name Livesay connected to it somehow. 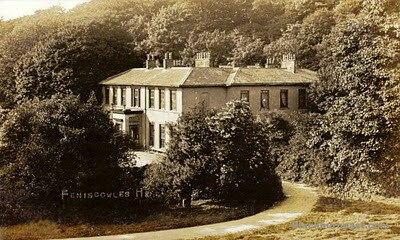 I have Livesay connections to the Feniscowles Old Hall (Higher Farm) all the way back to the 1400s. Are you part of this family? It seems people mistake the ruins for the Old Hall. The building everyone is writing about here was actually the New Hall. Our building is the farm house higher up that is still occupied, also called the Livesay Hall. I think Mr Smith of Higher Feniscowles Farm, Links lane, Pleasington owns the land it stands on now. My grandmother (welsh) worked at the hall as a cook. Know nothing more. Presume a census at the beg. Of last century would tell us. I used to live in Feniscowles from 1964-1976. My late Dad used to take us for walks in the ground and we would sit in front of the Ruins. I have fond memories of this place and It saddens me that it was left to deteriorate. 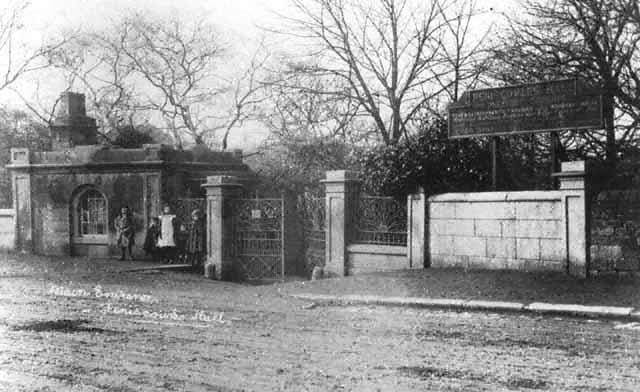 I have 2 photographs one of the Hall itself dated 1906, and the other is the back entrance near Pleasington Church.